John Ferneley, Sr. was born in the pretty village of Thrussington and was the youngest son of a wheelwright. 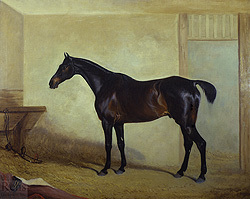 Ferneley’s artistic talent was first noticed by the Duke of Rutland, who encouraged and possibly sponsored him to become a pupil, in 1803, of the noted equestrian artist Benjamin Marshall. Ferneley spent the next three years as Marshall’s apprentice and during this period he joined the Royal Academy School, exhibiting his first painting their in 1806. Between 1806 and 1809 he traveled throughout Ireland and finally returned to England to marry. From 1810 – 1812 he returned to Ireland twice to paint a large number of sporting paintings commissioned by the wealthy Irish landed gentry. Ferneley had six children with his first wife (who died in 1836), three of whom became artists. By 1817 he was living in the Leicestershire town of Melton Mowbray, which was at the time the center of a blossoming hunting scene. It was here that he met many wealthy patrons and his work was highly praised and sought after not only by the local Dukes and Earls, but Beau Brummel and Count d’Orsay. Examples of his work can be found in many important private and public sporting collections, including those at The National Museum of Racing, Saratoga; The Tate Gallery, London; Hull Art Gallery; Worthing Art Gallery; and the Leiscester Art Gallery.